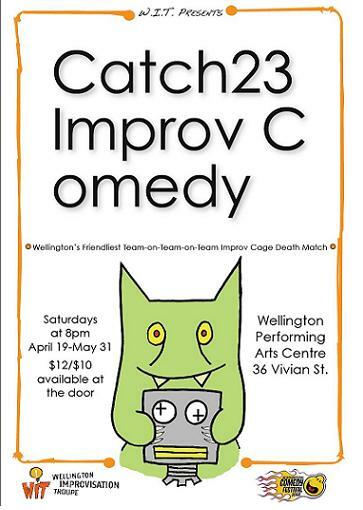 Catch 23 bought various Wellington improv groups together in “Wellington’s friendliest team on team on team improv cage death match”. 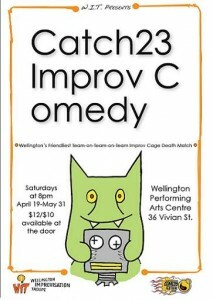 Direct from the dirty underground streets of North America comes the newest team on team… on team improv comedy cage match. 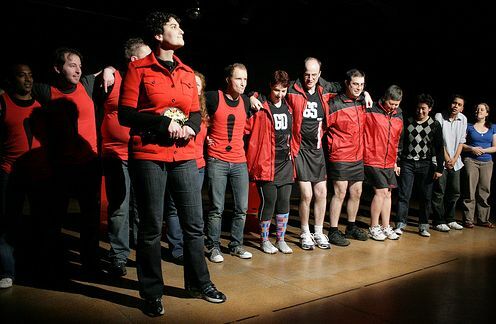 Watch as teams from around Wellington fight in this bloody battle royale of improv mayhem to claim the title and defend their crown week after week. Featuring Wellington Improvisation Troupe, The Improvisors, Vic Uni Theatresports, Funk Rabbit.. This entry was posted in Other formats, past shows and tagged catch 23, improv, improvisation, teams on April 19, 2008 by MaDmin.